Jenna here. This one is a good one. Nate is obsessed with French onion soup. He orders it when we go out to dinner a lot. But he is super particular about the way he likes it. The onions can’t be too sweet. They have to have that perfect savory undertone. 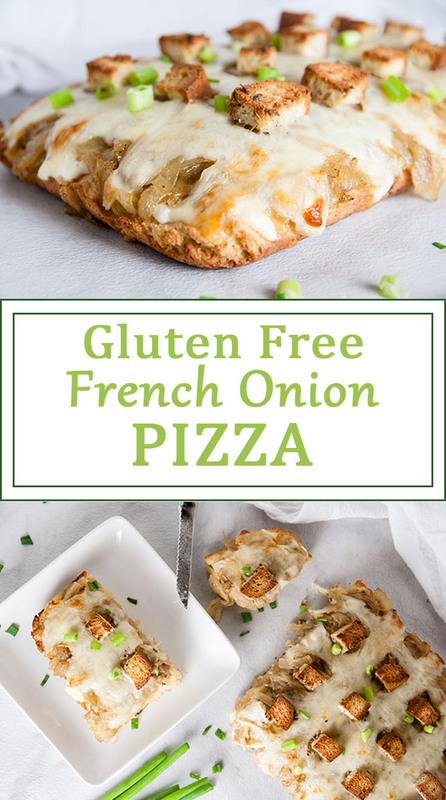 Well, let me tell you my friends, this french onion gluten free pizza is a thing of pizza beauty. I mean perfection in pizza form. And I am not even nearly as enthusiastic about French onion soup as he is. But dang. So good. If you remember the white pizza post, I said make the two crusts and store the other one for this week? 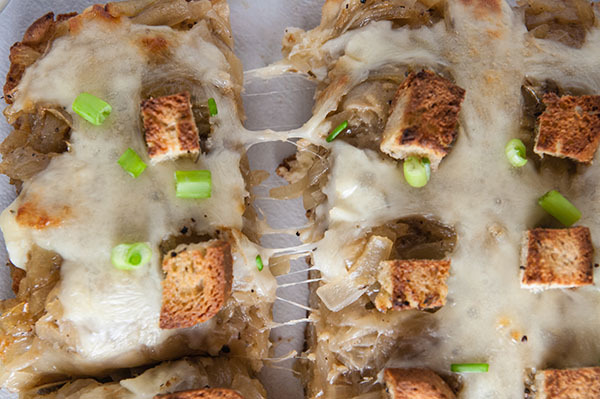 Well, this French Onion Gluten Free Pizza is why. And then it clicked. 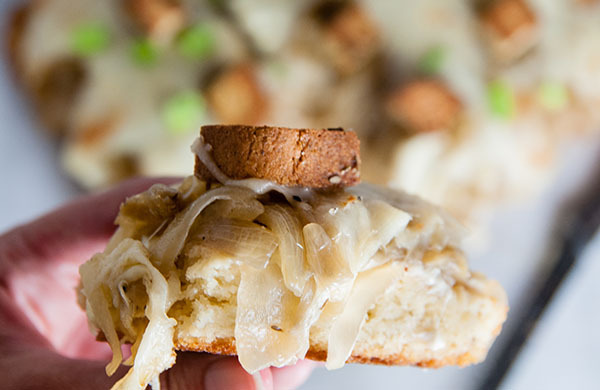 Why not create a pizza using the onions in French Onion Soup? 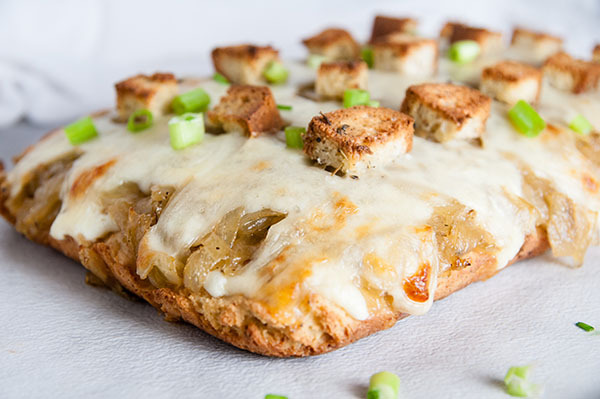 So that’s exactly what I did with this French Onion Gluten Free Pizza recipe. I need to cook the onions until they are all soft. 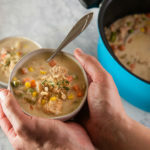 I need to make the soup more savory, less sweet. 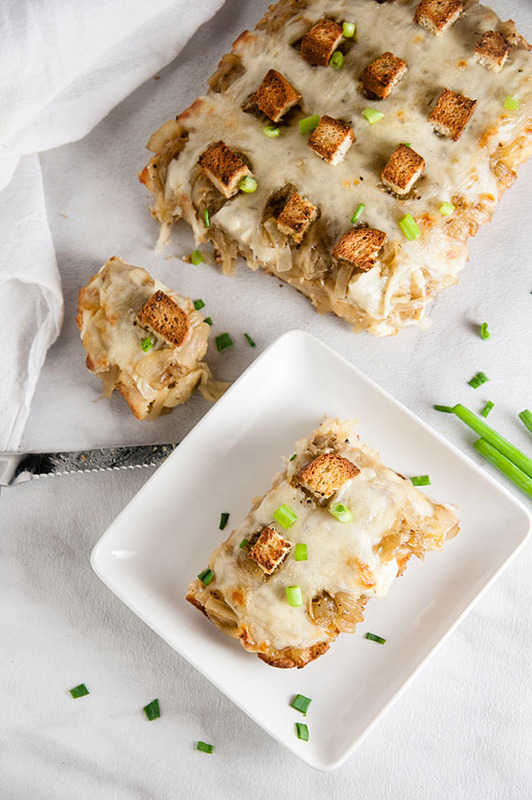 It needed croutons – yes, even on top of a pizza crust, it still needed croutons because carbs. Yeah, I can be picky about French Onion soup. It can be a real challenge at times. If the onions aren’t cooked well, I don’t like it. If the soup is overly sweet, I don’t like it. And if someone crams a non-toasted piece of bread into it, I have a hard time eating it. So, I took all this into consideration when making the French Onion Gluten Free Pizza. Now, people get this impression that French Onion soup is hard to make. It’s really not. The most labor intensive part is cutting up several onions. Even slicing six onions into thin slices took less than ten minutes. That was the only real prep. After that, it is the cook time. It does take about an hour and fifteen to an hour and a half to get the onions just right. But this is not a stand in front of the pot and stir every minute scenario- no in fact, while the soup was cooking I was able to walk away and watch My Little Ponies with the Goose. The onions just do their thing. Really, it’s only the last few minutes that are crucial to avoid burning. Those of you afraid of the time commitment, the results are well worth the wait. 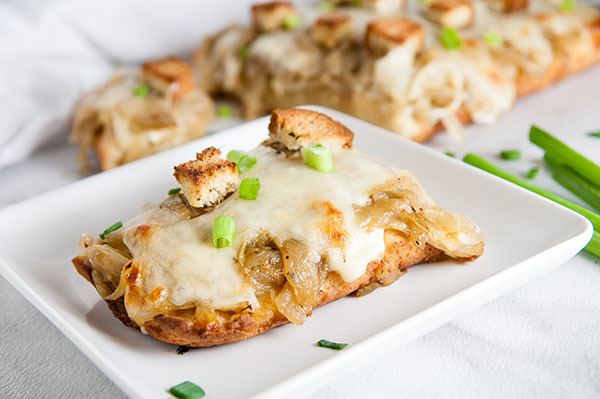 The French Onion pizza melts in your mouth when you eat it and offers everything French Onion soup does: sweet, savory onions, gooey cheesiness, and crunchy croutons. Tip: if you have a toddler, don’t skip making the croutons. And make extra. Goose ate them like they were candy. Meanwhile when you’re waiting for those onions to do their thing, think about how delicious this will taste when they are done. Melt the butter in a large pan over medium-high heat and add the onions, 1/2 cup of the sherry crushed garlic, and bay leaf. About a half hour into cooking, add the other 1/2 cup of sherry as well as the Savory, Thyme, and salt and pepper. Cook for about another half hour, stirring about once every 5 minutes.- if the onions are starting to burn, at any time, just reduce heat. When the onions are starting to look brown and all seem limp, start stirring them more frequently. You do not want to let them sit for too long to avoid burning them. When the onions are brown to dark brown in color and appear sticky, remove from heat. Cut the mozzarella cheese into about quarter-size pieces and place around the entire crust. Lay the slices of provolone in a checker board fashion. 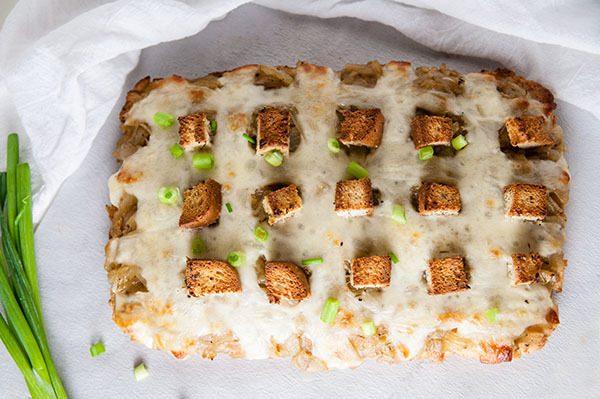 Bake at 425 for about 6-8 minutes or until the croutons are golden-brown and the cheese is bubbly. Toss bread in a bowl or bag with salt, pepper, garlic, and olive oil before placing on-top of pizza. 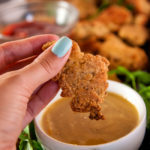 *We use gluten free bread and homemade gluten free pizza crust. Feel free to substitute regular bread and crust to suit your liking. You can find the gluten free crust recipe .here. Now your talking. I would love this and probably could eat the whole thing. What a creative pizza recipe! Beautiful photos, too. 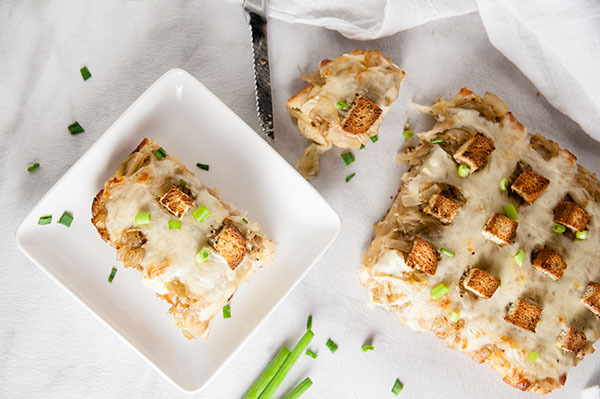 French Onion Soup is my favorite and so is pizza. I’m pinning this for later! I love that it’s gluten free! What a happy marriage this is! Can’t wait to try it! Wow, this looks awesome! 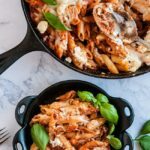 Totally loving it and definitely want to make it! 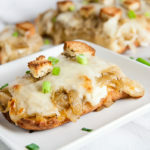 I never would have really thought of making a french onion pizza before, but now that I think about it, it sounds like an amazing idea! Thank you! 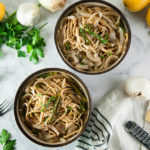 Definitely give it a go- sounds strange, but is so delish. Well, that is a bread-fix if I ever so one. That is fabulous and really inventive. We had a wonderful gluten free pizza last night as well. Ours was loaded with al sorts of evil. It’s our Sunday night ritual before we get back on plan on Mondays.